It's 25 degrees inside today. A perfect time for a light, refreshing wheat beer - in my new DdC glass, no less. 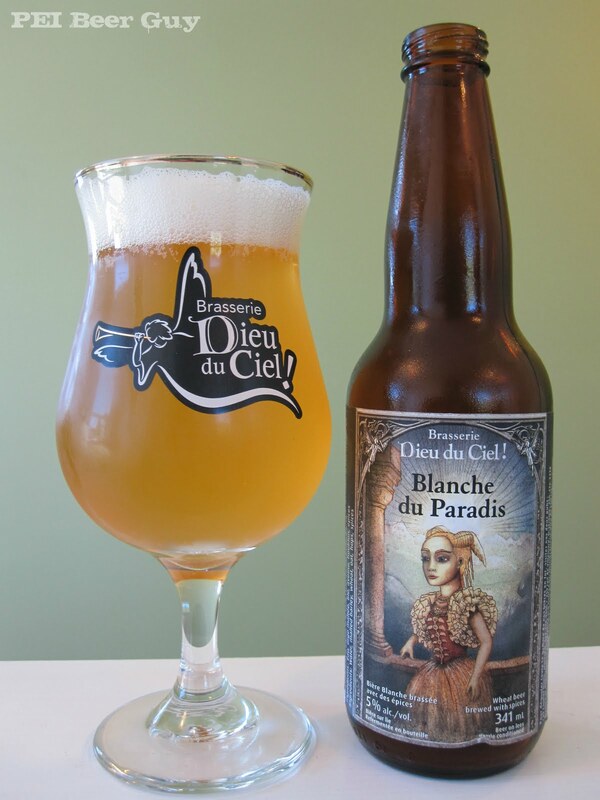 Blanche du Paradis pours a slightly cloudy yellow with a hint of orange - almost like a faded school bus. The head is nice, but is not retained for very long. The aromas are bright - pineapple, orange peel, coriander, yeast, wheat... maybe some honey and apple. The coriander and yeast intensify as it warms. The flavour is more the same - but is more intense, or not as light - especially in a couple of areas. Some more mellow (but strong) notes of apple and fresh bread come out, especially at the beginning of each sip and on the exhale. The coriander has a bit of a kick in the first sip, but it levels out somewhat after that. The feel? A bit of a citrus acidity without much of the citrus flavour (the orange peel is just faint). The finish is sticky up the middle and back, and dry on the sides. Overall, more dry than anything else. The carb is just right for this ale - not prickly, but present enough to feel refreshing. Overall, a great beer to beat the summer heat. I may even be refreshed enough to do some vacuuming now.